is product differentiation not a thing anymore? Where's the AC vs WS value prop? exactly, they just copy each other. You raise the price, I will too. You lower the bar, I will too. What we have is not true competition with AC WJ splitting the market 47/47. Look at T Mobile in the US. They have really shaken up the market and differentiated itself and made Verizon Sprint AT&T compete. Consumers are better for it. When people say airfares are lower today than 5 years ago, I doubt it. Count the billions in ancillary charges made by airlines each year, things that have been taken away from passengers in the name of choice, add that ancillary revenue back on the price, we are not farther ahead. pewpew, eigenvector and Jumper Jack like this. Do we have a list of routes yet, beyond YEG-YVR? Do we know of this affects Air Canada Express as well? My (senior citizen) parents are retired and travel 4-5 times per year, either transcon or overseas. This has exactly been my dad's point. By racing to the bottom and stripping away every perk leisure travellers like my parents might appreciate, there is now zero reason for them to choose Air Canada. Or to put it another way, AC makes no attempt whatsoever to incentivize my parents to choose AC over a competing carrier. Not via fare, frequent flier miles or anything else. As a result, he just books whatever's convenient for my mum and dad for a a given trip. there is now zero reason for them to choose Air Canada. But to come back to your case, PY should be the answer. Roughly priced like relatively low Y used to be. Right - But if four airlines, including AC, all have exactly the same price - What is Air Canada doing to incentivize someone to choose them over the other three? That's my dad's point. 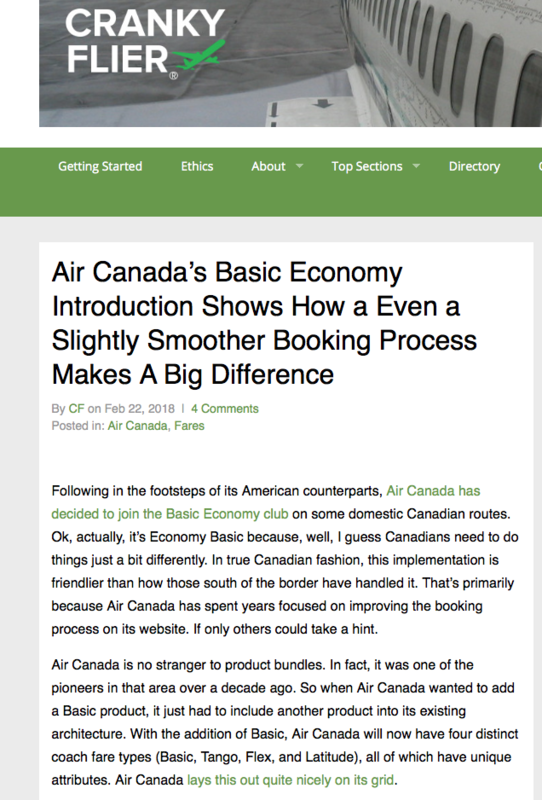 Air Canada's not interested in doing anything to try to win his business. Tell that to the corporations that will insist on booking lowest fare for biz travel. Just imagine if (when) BE (Y- ?) becomes available on the YYZ-YUL-YOW triangle or on YYC-YEG. And with that I realize how blessed I am. I'm independent, and bill my clients for travel. For a few years, various clients told me their travel department had to do the booking. No problem I said - full J. Then they started indicating lowest fare. Nope. Once they started getting sillier, I just stopped acknowledging their existence. I now flat fee bill all my travel in my contrats. No corporate travel department. The idiots have been done away with. I sympathize for those who work within organizations with such mindless functionaries. Or, you could see it as a fare that will let people who would otherwise not be able to afford to fly to take a trip. Seriously, you should have to be able to pass a compassion test to comment here. That makes the assumption that it's cheaper than previous fares. Stranger and Diabeetus like this. You must be new to the internet. Welcome to the Thunderdome buddy. lallied, Diabeetus and 24left like this. And that is the result of "managing inventory". Their planes are full, so they don't care about loyalty. They do care about inventory. Planes being full means little until we know at what price. As to loyalty, it is of course true that at the low end it means nothing. Still that does not mean that across the board, they don't care. True rationale for these lowest fares is the impact of search engines identifying "the lowest fare." Without taking into account what is included in the fare or not. In other words, let fools be fools. Especially if in the end when paying extra for stuff, it actually costs more.